Heavily illustrated with line drawings and photos in color & black & white. Small Ships. The subtitle says it all: "A book of study plans of tugs, freighters, ferries, excursion boats, trawler yachts, houseboats & fishing vessels - working vessels and workboat heritage yacht designs from the boards of The Benford Design Group." This latest volume of ideas, thoroughly revised, updated and expanded, contains scores of detailed study plans for a tremendous variety of types and styles of small ships. Every one is a salty and practical cruising vessel and many of them have all the comforts to make living aboard a delight. Each design is introduced with a brief description of its creation and history and accompanied by layout drawings and/or photos. Many of the designs trace their origins to working vessels and heritage powerboats. All have a refreshing frankness about them, absent any tricky styling, glitter or glitz. Some are ideas, dreams of what might be or ought to be, and one just might be your own special dream boat. 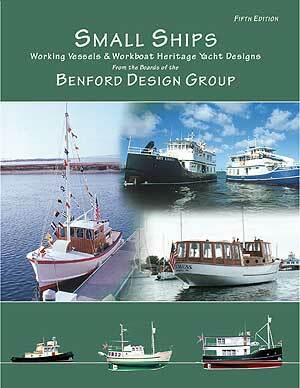 The reason the Benford Design Group is called "The Liveaboard Company" is well shown in this book. They have created new generations of small ship designs and ideas primarily for clients who want to make their boats their homes. The wide ranging imagination required to create this tremendous variety of types and styles of small ships is evident on every page. The types of designs shown range from conventional cruisers to unconventional freighter and ferry yachts. Every one is a salty and practical cruising vessel, and many of them have all the comforts to make living aboard a delight. "Versatility In Design" is evident throughout. This is a hallmark of the Benford Design Group's work, and many of the boats show several variations on a theme. Since the variations are only limited by one's imagination, you can see that there is a very active imagination at work here. This Fifth Edition of Small Ships is three times the size of the first one. This greatly expands the number of boats shown, with the addition of a lot of other types of powerboat designs. It is a singular contribution to maritime publishing showing the range of the design process, from rough sketches to the finished and detailed design, including the designer's contract and how designers conduct business. Take a look through the color photo section too, and see how nicely some of these boats have been built. There are ideas galore for your next cruiser, or for upgrading your present one. While some may characterize the yacht design business as serving the "adult toy" market, this book shows that the Benford Design Group's work is more truly in making peoples' dreams come true. He lived aboard for over a decade and a half, living on both sail and power boats, and brings this experience to all his design work. His recent design work varies from small craft to freighter yachts to a 40 meter (131') ketch. When not off cruising, he can be found in his St. Michaels, Maryland, office working on one of his dozen or so current design projects. "...let me say that I have spent hours perusing Small Ships...to my utter delight. Here is Benford at his best with an infinite variety of arrangements and layouts on several series of working craft hulls, including his Florida Bay Coaster 40, 50, and 65 footers built by Reuben Trane..."
© 1998-2019 Tiller Publishing. All rights reserved. Site Designed and Maintained by: RhynoDesigns.